Hans Jaray studied at the Akademie für Musik und darstellende Kunst in Vienna. Fellow students there were Paula Wessely, Karl Paryla and Käthe Gold. He was engaged at the Neuen Wiener Bühne and then from 1925 to 1930 at the Volkstheater. From 1930 to 1938 he worked under Max Reinhardt at the Theater in der Josefstadt. At the same time he appeared in movies in Germany. He was in a relationship with Paula Wessely at the time he entered into a love affair with Marlene Dietrich around 1934. Still he and Wessely remained friends and often would share the stage in years to come and he was a witness when she married Attila Hörbiger in 1935. He was Jewish and after the annexation of Austria in nazi Germany in 1938 he emigrated to the USA. Until 1948 he worked in Hollywood and New York. In 1948 he returned to Vienna where he worked at the Volkstheater and from 1951 at the Theater in der Josefstadt. In 1960 he became the director of the Reinhardt-Seminar. He died in 1990 in Vienna. 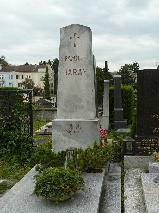 The grave of Hans Jaray at the Hietzing Friedhof, Vienna.